For the former Brooklyn–Manhattan Transit Corporation 4 service, see N (New York City Subway service). Bronx-bound 4 train of R142As leaving 125th Street. The 4 Lexington Avenue Express is a rapid transit service in the A Division of the New York City Subway. Its route emblem, or "bullet", is colored forest green since it uses the IRT Lexington Avenue Line in Manhattan. The 4 operates at all times. Daytime service operates between Woodlawn in the Bronx and Utica Avenue in Crown Heights, Brooklyn, making local stops in the Bronx and express stops in Manhattan and Brooklyn; limited weekday rush hour service, as well as late night service, is extended beyond Utica Avenue to/from New Lots Avenue in East New York, Brooklyn. During rush hours in the peak direction, 4 trains skip 138th Street–Grand Concourse. Late night service makes local stops along its entire route. Until 1983, rush hour 4 trains originated and terminated at Flatbush Avenue–Brooklyn College in Brooklyn. During the extension of the IRT Lexington Avenue Line north of 42nd Street–Grand Central Terminal, shuttle elevated trains served the IRT Jerome Avenue Line (which at the time was only between East 149th Street–Grand Concourse and Kingsbridge Road) starting June 2, 1917. On April 15, 1918, shuttles were extended to Woodlawn. A second shuttle, using subway cars, from 149th Street–Grand Concourse to Grand Central started on July 17, 1918. On August 1, 1918, the entire Jerome and Lexington Avenue Lines were completed and the connection to the Broadway–Seventh Avenue Line at 42nd Street was removed. Trains began running between Woodlawn and Bowling Green. On December 11, 1921, Lexington Avenue–Jerome Avenue subway trains began running north of 167th Street at all times, replacing elevated trains, which ran to Woodlawn during rush hours, but from then on terminated at 167th Street during non-rush hours. Beginning on November 4, 1925, rush hour 4 trains were extended from Atlantic Avenue to Crown Heights–Utica Avenue. Two years later, on December 5, 1927, weekday evening service was extended to Utica Avenue. The following year, midday 4 service also went to Utica Avenue. As of 1934, 4 trains ran from Woodlawn to Utica Avenue weekday rush and Saturday morning peak and afternoon, to Atlantic Avenue weekday midday, Saturday morning after the peak, and late nights, and to South Ferry evenings and Sundays. Trains ran express in Manhattan except late nights, and in Brooklyn. This was the first time the 6 became the Pelham Shuttle between Pelham Bay Park and 125th Street–Lexington Avenue. On August 20, 1938, Saturday morning after the peak service was extended to Utica Avenue. Beginning on May 10, 1946, all 4 trains were made express during late nights running on 12 minute headways as the 6 went back to Brooklyn Bridge during that time. Previously 4 trains ran local from 12:30 to 5:30am. At this time 4 trains terminated at Atlantic Avenue. Beginning on December 16, 1946, trains were extended from Atlantic Avenue to New Lots Avenue during late nights, running express between Atlantic and Franklin Avenues. The New York City Board of Transportation, predecessor to the New York City Transit Authority, began to introduce replacements to older subway cars beginning with the R12 cars in 1948. With these cars, numbers were publicly designated to the former IRT lines. Lexington–Jerome trains were assigned the number 4. By 1964, all cars had the route numbers on them. During 1950, Saturday morning service was cut back to South Ferry. Starting on December 15, 1950, four 4 trains began operating during rush hours to Flatbush Avenue on the Nostrand Avenue Line. Also on that day, weekday midday service was cut back from Atlantic Avenue to South Ferry. Additionally, on January 18, 1952, 4 service to Atlantic Avenue during weekday middays was restored. On March 19, 1954, late-night service in Brooklyn began making all stops, but resumed operating express between Atlantic Avenue and Franklin Avenue on June 29, 1956. On May 3, 1957, the weekday rush trains to Flatbush Avenue were discontinued, while at the same time evening, Saturday and Sunday afternoon trains were extended to Utica Avenue, while Sunday morning trains were extended to Atlantic Avenue. Starting on March 1, 1960, late-night 4 trains resumed making all stops in Manhattan; this was the first time the 4 and 6 ran local in Manhattan together late nights. This arrangement ended on October 17, 1965, when the 4 went back express in Manhattan late nights. Beginning on April 8, 1960, nearly all AM rush hour 4 trains ran to Flatbush Avenue, and PM rush hour 4 trains alternated between Flatbush and Utica Avenues. During weekday evenings and late nights 4 trains also went to Flatbush Avenue, making all stops in Brooklyn. As a result of the opening of the main portion of the Chrystie Street Connection along the Manhattan Bridge on November 26, 1967, the 4 train was color coded magenta under the first color scheme. The color coding of lines was introduced as a matter of having a universal system of signage and nomenclature. By 1972, the 4 began to skip 138th Street weekdays during rush hours in the peak direction which it continues to do (AM to Manhattan and PM from there). At that time, the 4 went to Atlantic Avenue at all times, but was extended to Utica Avenue rush hours running express in Brooklyn along Eastern Parkway. Select 4 trains also ran to Flatbush Avenue rush hours as well running express between Atlantic and Franklin Avenues, and late night service was still all stops in Brooklyn to Flatbush Avenue. On May 23, 1976, Sunday morning trains were extended to Utica Avenue, express in Brooklyn. Beginning on January 13, 1980, all 4 trains resumed operating local in Manhattan during late night hours to replace the 6, which again became the Pelham Shuttle between 125th Street and Pelham Bay Park. This service cut affected 15,000 riders, and was criticized by Manhattan Borough President Andrew Stein as no public hearing was held. While late night 6 service to Brooklyn Bridge was restored on October 3, 1999, the 4 continues to run local at those times. Starting on July 10, 1983, all 4 trains ran to Utica Avenue, but weekday midday trains ran only to Atlantic Avenue, and late-night trains ran local during late nights and Sunday morning operating to New Lots Avenue. On August 29, 1988, the current service pattern began with weekday midday 4 trains also going to Utica Avenue, and the 5 terminating at Bowling Green to make room for this (the 5 has since been extended to Flatbush Avenue with the 2 weekdays until 8:45pm). In April 2000, midday 4 service was cut back from Utica Avenue to Atlantic Avenue. From June 8, 2009, to June 26, 2009, New York City Transit conducted a pilot program for express Jerome Avenue Line service. 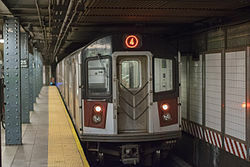 Four morning weekday rush hour trains from Woodlawn stopped at Mosholu Parkway, Burnside Avenue and 149th Street–Grand Concourse before they resumed regular service in Manhattan and Brooklyn. On July 6, 2009, select Bronx bound 4 trains began running express from 167th Street to Burnside Avenue to terminate at the latter station before running out of service to the Jerome Yard. On October 26, 2009, another 4 express pilot program was implemented based on the success of the first and ran until December 11, 2009. This program was the same as the one in June except that express trains stopped at Bedford Park Boulevard–Lehman College. As a result of planned repairs to Hurricane Sandy-related damage in the Clark Street Tube, which carries the IRT Broadway–Seventh Avenue Line, on weekends from June 17, 2017 to June 24, 2018, the 4 was extended to New Lots Avenue on weekends, making local stops in Brooklyn south of Nevins Street in place of the 3. 28th Street ↓ 6 Station is ADA-accessible in the southbound direction only. N R ​W (BMT Fourth Avenue Line) Station is ADA-accessible in the northbound direction only. ^ a b "4 Subway Timetable, Effective June 24, 2018" (PDF). Metropolitan Transportation Authority. Retrieved June 24, 2018. ^ "mta.info | Line Colors". web.mta.info. ^ a b c d e f g h i j "NYCT Line by Line History". www.erictb.info. Retrieved 2016-09-23. ^ "An Improvement in Service for Passengers on the Jerome Avenue Line North of 167th Street". pudl.princeton.edu. Interborough Rapid Transit Company. December 11, 1921. Retrieved 2016-09-19. ^ "Increased I.R.T. Subway Service in Brooklyn". pudl.princeton.edu. Interborough Rapid Transit Company. November 1925. Retrieved 2016-09-19. ^ "24-Hour Express Service on IRT To Become Effective at Midnight" (PDF). New York Times. May 9, 1946. Retrieved February 21, 2016. ^ Report for the three and one-half years ending June 30, 1949. New York City Board of Transportation. 1949. hdl:2027/mdp.39015023094926. ^ a b "NYCT Line by Line History". www.erictb.info. Retrieved 2016-02-23. ^ "City to Increase Subway Service On the IRT and BMT Lines Today" (PDF). New York Times. December 12, 1946. Retrieved February 21, 2016. ^ "Line Names". www.thejoekorner.com. Retrieved 2016-09-19. ^ "BROOKLYN I.R.T. CHANGE; 4 Lexington Avenue Expresses to Serve Flatbush Station" (PDF). New York Times. December 15, 1950. Retrieved February 22, 2016. ^ "Changes on I.R.T. Set: Additional Express Service on Brooklyn, Flushing Lines Day" (PDF). New York Times. January 10, 1952. Retrieved January 25, 2016. ^ "January 1980 IRT Service Changes". New York Division Bulletin. December 1979. ^ "Suit seeks to bar cutbacks on Lexington Ave. subways". New York Daily News. January 11, 1980. Retrieved August 14, 2018. ^ "New IRT Schedules – Increased Service to Flatbush Avenue". New York Division Bulletin. July 1983. ^ "MTA New York City Transit Pilots Bronx Express Service Along the Jerome Ave. Line" (Press release). New York Metropolitan Transportation Authority. 2009-06-04. Retrieved 2009-06-08. ^ "Bronx Express Pilot Program June 8 to 26, Monday to Friday, 7 AM to 8 AM". mta.info. Metropolitan Transportation Authority. 2009-06-10. Archived from the original on 2009-06-10. Retrieved 2016-09-23. ^ "Bronx Express Phase II October 26 to December 11, Monday to Friday, 7 AM to 8:20 AM". mta.info. Metropolitan Transportation Authority. 2009-11-22. Archived from the original on 2009-11-22. Retrieved 2016-09-23. ^ "Transit & Bus Committee Meeting December 2016" (PDF). mta.info. Metropolitan Transportation Authority. December 12, 2016. pp. PDF–169 to PDF–175. Archived from the original (PDF) on 2016-12-10. Retrieved December 9, 2016. ^ "Clark St Tunnel Reconstruction Weekend Service Changes". web.mta.info. Metropolitan Transportation Authority. June 8, 2017. Archived from the original on 2017-06-08. Retrieved May 9, 2018. Wikimedia Commons has media related to 4 (New York City Subway service). "4 Subway Timetable, Effective June 24, 2018" (PDF). Metropolitan Transportation Authority. Retrieved June 24, 2018.